PCA LLC has been serving real estate investors since 1999 yet the most exiting investment exercise we have encountered is in front of the Courthouses! Yes, Trustee Sales have been around forever and they are not going to go away. Our team of affiliates (analysts, bidders, field inspectors, attorneys, contractors and agents) has placed us on the forefront of this exiting market. Our investors come all around the world, predominantly from markets with cash-based economies. "Cash is King" and that is so true for this "game". With all these sophisticated systems in place we are looking at ROIs in the range of 8-14% (on the conservative side) in a process that most of the time beats the 120 day turnover forecast. For more information on these exiting opportunities, please use the Info request Form. With the struggling economy and real estate market, there are quite a few homes on the market that are in some form of “distress”. With a job loss or reduced income, distressed sellers may no longer be able to pay their mortgage, foreclosure may be imminent, or perhaps they owe more the the property is worth. For buyers, these situations can provide opportunities to get a property at an attractive price, but there is a jumble of industry terms and scenarios that can be confusing. Let’s take a look at each one. Pre-foreclosure – This is a generic term for a home where the owner has fallen behind on mortgage payments. The home may or may not be in the formal foreclosure process. It can take four or more months of late payments for the foreclosure process to begin. If you buy a home in this state, the seller will end up paying up the delinquent payments at closing, provided that there are enough proceeds from the sale. Short Sale – A short sale is a home being sold for less than the balance on the underlying mortgage. This happens when the value of a home has declined so much that a sale is no longer able to pay off the mortgage. Just because a home is a short sale does not mean that the owner has fallen behind on payments. If the owner has cash, they can pay the remaining balance at the closing of the loan. For a seller who does not have the cash to pay the difference, they can negotiate with their bank to accept a payoff for less than the remaining balance of the mortgage. Foreclosures are expensive and time-consuming, so oftentimes banks will be willing to make a concession to sell the property faster. See my previous post for more info about short sales. Right to Cure – In most situations, homeowners can stop the foreclosure process by bringing their payments current or by negotiating a payment plan with their mortgage company. Depending on the state, this right-to-cure may be a month before the foreclosure sale but can even be as short as the day before the auction. Difference Between Non-Judicial and Judicial Foreclosures – Each state has different laws regarding the foreclosure process. You need to educate yourself about the process in your particular state. Non-judicial Foreclosure – Generally, this is the preferred method of foreclosure. The process can happen without having to go to court, saving time and money. While it varies from state to state, generally there is a notice of default/notice of sale issued to the homeowner. If the homeowner does not cure the default by the deadline, there will be a public auction where the home is sold by the trustee of the deed. If the auction succeeds, the property is transferred to the new owner via a trustee deed. If the auction fails, the ownership of the property reverts to the bank who has the mortgage on the property. In both cases, the mortgages are forgiven for the original borrower. Judicial Foreclosure – This method is processed in court, thus can take more time and money. One advantage for the lender is that they can receive a judgment against the original borrower as an attempt to collect any remaining funds that they are owed. The process begins with the lender filing a complaint stating details about the debt and default. The homeowner is served notice of the complaint. If the court finds the debt and default to be valid, they will authorize a sheriff’s sale of the property. In a successful auction, the property is transferred to the new owner via a sheriff’s deed. If the auction fails, ownership of the property reverts to the bank who has the mortgage on the property. Property Auction/Trustee Sale – Many foreclosures never reach auction. The owner either brings the mortgage current and cures the default, or a successful short sale may happen. As a buyer, you can purchase properties at both trustee sales and sheriff sales. However, this process is NOT for novices. While you may find great deals, you have little or no time to actually evaluate the property that you are buying. It also frequently requires cash payment for the entire price of the property. If you pursue an auction, be sure to engage professionals to help guide you through the process. Deed-in-Lieu of Foreclosure – Sometimes mortgage companies allow a homeowner to simply surrender their deed to the lender, freeing them from both the mortgage payments and home ownership without having to go through the actual foreclosure process. These properties become “bank-owned”. 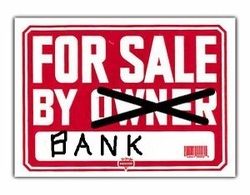 Bank-Owned Property (REO) – If a property does not sell at auction or if the lender has accepted a Deed-in-Lieu of Foreclosure, the property is now owned by the bank. These properties are called REO, which stands for Real Estate Owned. While banks may advertise REO properties on their own websites, these homes generally get listed for sale through a real estate agent, much the same way that private individuals list their homes for sale. This gives the property the broadest exposure to the market, maximizing the chance of sale. When buying a bank-owned property, there are often bureaucratic hoops to jump through with the bank, so you should anticipate some delays along the way. A real estate agent who has facilitated REO sales can help you navigate this bureaucracy. There are certainly opportunities for buyers to secure a good deal on a home through these processes. However, keep in mind that there are plenty of motivated sellers in the market who are not facing foreclosure. You may receive an equally great deal from one of those sellers, so don’t limit your search to only distressed properties. If you do choose to pursue distressed properties, by all means do your research and seek professional advice. Just remember, a very cheap bank-owned property may still be a bad deal. There is generally a reason that the auction wasn’t successful. Don’t be lured in to your own purchase without understanding the property’s real market value.